Central air units are beneficial to have in mobile homes. Not only do they produce cool air, but they also reduce moisture, which makes the air more comfortable and less likely to promote mold growth. Air conditioners come in a variety of sizes, all of which are measured in BTUs, or British thermal units. In order to find the appropriate size of central air unit for a mobile home, you must first figure the square footage of the home. Since mobile homes come solely in rectangular shapes, this process only requires a couple of minutes of your time. Central air can make a mobile home more comfortable. Measure the length and width of the mobile home with a tape measure. If necessary, write the measurements down so you don't forget them. Multiply the length and width together to get the total area of the mobile home. For example, if the mobile home is 15 feet wide and 80 feet long, multiply 15 by 80 to get 1,200. 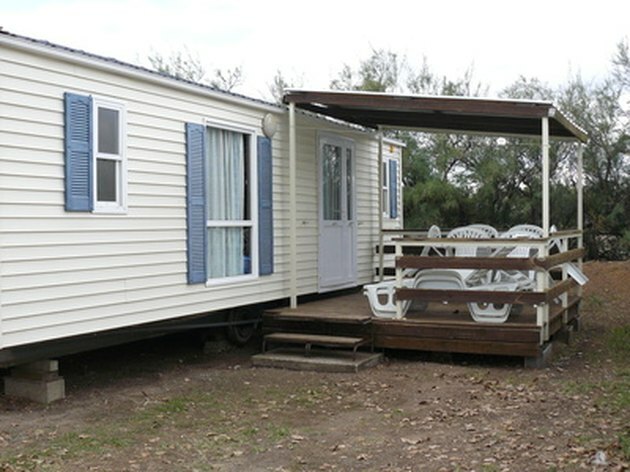 This means the total area of a mobile home of this size is 1,200 square feet. Compare the square footage to the Energy Star central air unit BTU chart to determine the best size for your mobile home. Some mobile home sizes may fit into two different air conditioner BTU categories; for example, a 1,000-square-foot home can use either an 18,000 or 21,000 BTU air unit. In such cases, consider other factors, such as the amount of sunlight that hits the mobile home throughout the day, to determine which size is best. For example, if the mobile home is heavily shaded, the necessary BTUs can be decreased by 10 percent, so the smaller size would be the better choice.